AUSTIN (KXAN) — People who can't make it to the Austin Marathon can cheer on the runners from wherever they want to watch. KXAN is teaming up with the Ascension Seton Austin Marathon to host FloTrack's live coverage on race day. KXAN will host a live-stream of the race online, as well as provide preview and follow-up coverage on its morning and evening shows Sunday, Feb. 17. This is the 28th annual year of the race, and some of KXAN's own will be running it as well. "We're proud to support the Austin Marathon through our station-wide initiative, Simple Health," said Eric Lassberg, Vice President and General Manager of KXAN. 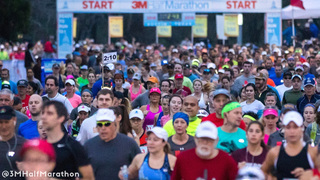 "By highlighting all events during Austin Marathon weekend, including the Austin Marathon 5K, we hope to raise awareness for Central Texans on fun ways to be active within their community." Simple Health is KXAN's public service initiative providing wellness stories to encourage people to live healthy lives. People from all states and more than 30 countries have run the Austin Marathon in the past. Online registration is still open for the events. AUSTIN (KXAN) -- One man is in serious condition this morning after being shot around midnight Thursday while inside his car at an Applebee's in North Austin. Austin Police say he was at the restaurant near I-35 and U.S. 183 to meet an acquaintance and was talking to that person through the window when a gunman tried to rob him. The victim says the gunman told him, "Give me your watch or I'll shoot you," according to APD Cpl. Adrien Chopin. AUSTIN (AUSTIN BUSINESS JOURNAL) — Austin is near the top of another list for real estate growth — but not in the way most residents and policymakers would want. The East Austin ZIP code of 78721 ranked No. 4 among the fastest-gentrifying neighborhoods in America's major cities in an analysis by Realtor.com. LEANDER, Texas (KXAN) — Powerful storms ripped through Central Texas Wednesday afternoon, leaving residents of one neighborhood in Leander reeling as they scanned the widespread damage. KXAN crews arrived on Wednesday right when people began to emerge from their homes to see what the storm left behind. "It looked like looking into a washing machine out the window," said Daniel Brown, who lives in Leander. “I was not getting too excited about it, but my wife has been proven right about it. This was a real storm."